I carried out a routine repair and upgrade of a composite door in Paisley today. The home owners never went down the usual step of downgrading there composite door to a UPVC door and found my number through a nieghbour that had referred me. 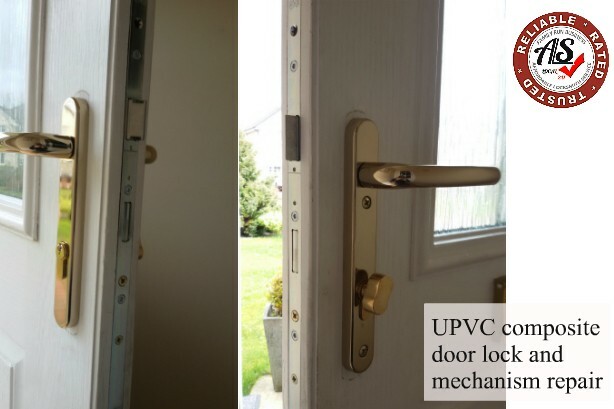 The door was fitted with an old GU 45 backset mechanism. The 45 backset mean't that a gearbox change was not an option in this case so I had to change the complete mechanism. Because I was changing the mechanism I changed the lock also. This is an inclusion in the price and I never charge extra for it. The home owners also wanted a change of door handle. The old door handles were looking worn and haggard so I supplied and fit a set of premium sprung load door handles. I had to order the parts as I did not carry this particular door locking mechanism with me. But once I ordered it I contacted my clients the day it came and made arrangements for the following day to fit it. So before I arrived I texted my clients to let them know I was coming [I hate being late] and completed the job in a timely manner. I found the door once finished to be a little sticky so I removed all the door receivers and adjusted them before reassembling and testing again. The door worked like a charm. I then cleaned up. All the old parts were cut up and disposed of and my work area hoovered up so that it was as clean as I had found it. My customer then tried the door and once happy settled up. Another happy customer and another potential referrer. For more information on the services A.L.S. Locksmiths provide please call 07712445612 and ask for Steve.